The Santa Barbara County wine country goes against the grain. While virtually all North American mountain ranges run north to south, this is the Western Hemisphere’s only major wine region with east-west trending ranges. This orientation—some might call it sideways—creates a gradation of microclimates suited to a diverse assortment of grapes. Long valleys open directly to the Pacific’s influence. And for every mile traveled inland, fog both becomes less frequent and lingers for a shorter time, as temperatures rise by a degree. It can be 68 in the Santa Rita Hills near Lompoc and push over 100 in the Happy Canyon AVA, the easternmost growing area. The center of the region is the Santa Ynez Valley, less than two hours from Los Angeles via San Marcos Pass. The drive’s about 20 minutes longer if you stick to the 101 for the coastal views, which include Santa Cruz Island, where one of Southern California’s earliest wineries began in the 1880s. The Santa Ynez Valley’s wine-making tradition is considerably younger, not even 50 years old. Once better known for the apple, peach, and olive orchards that still grow there, the valley remained a viticultural frontier for decades. The isolation nurtured vintners with an independent streak, and even now the majority of producers qualify as boutique wineries. Although designed to evoke a late 19th-century mansion, the Santa Ynez Inn ($249-$799) avoids Victorian fussiness. Recently renovated, the inn delivers the subdued elegance you want for a weekend of tasting. The muted palette and classic furnishings are refined, with little more than framed sheet music for artwork. Some rooms have balconies or patios, but the garden’s fire pits are ideal on cool nights. When you’ve had your fill of wine (the inn’s complimentary passport is good for tastings at 21 wineries), you can get familiar with the whiskey program in the library. Connecting Los Olivos to the the vineyards of the Santa Maria Valley, the Foxen Canyon Wine Trail is the definitive Santa Barbara County wine country drive. It’s named for British sailor-turned-rancher Benjamin Foxen, who, as legend goes, helped turn the tide of the Mexican-American War when he guided Bear Flag Republic troops around an ambush in the Gaviota Pass. The canyon is home to grazing cattle and scurrying quail as well as such leading wineries as Andrew Murray Vineyards, where you can sample Rhône varietals in a sleek yet rustic tasting room. One of the county’s earliest wineries, Zaca Mesa offers sommelier-led tastings and tours that explore its 750 acres. Farther up the trail, Foxen Vineyard & Winery honors its namesake’s seafaring days with labels emblazoned with a ship’s anchor. Built in a contemporary ranch design, Foxen’s newer tasting room is the place to try its Burgundian and Rhône-style wines. But the Shack, a seemingly rickety blacksmith shop from the 1860s where Foxen pours its Bordeaux and Italian varietals, is the trail’s classic stop. Known best as the gateway to Solvang and for the titular potage at Pea Soup Andersen’s, the freeway-straddling town of Buellton has emerged as the Brooklyn of the Santa Ynez Valley. Follow Industrial Way to the cavernous Industrial Eats, a winery-worker hangout popular for the house-made charcuterie and such faves as white shrimp with pancetta, garlic, and chile (above). Next door, the airy tasting room for Alma Rosa Winery & Vineyards, founded by pioneering county wine-maker Richard Sanford, incorporates reclaimed Douglas fir, ironwork, and a live olive tree into a converted warehouse. Nearby DorWood Distillery and Ascendant Spirits offer tastings of their higher-octane small-batch beverages as well. After five blocks, Industrial Way reaches the Santa Ynez River, where the restaurant Bottlest, part of the county’s largest winery production facility (tours available), has 52 varietals to sample from its automated wine dispensing system and a bar that looks out onto the Santa Rosa Hills. The rise of a tasting room monoculture and, with it, invasions of girls-gone-wine bachelorette bacchanalias have cost walkable, quaffable Los Olivos some of its country charm. At least on weekends. Having seen it all since he opened the Los Olivos Tasting Room & Wine Shop in 1987, Chris Benzinger remains the go-to guy for both candid opinions and a big selection of limited production pinot noirs. For wines from an iconic Santa Maria Valley vineyard, Bien Nacido & Solomon Hills Estate Wines draws more serious tasters than many spots in town. When it’s time to eat, grab a crispy catfish sandwich on brioche or a Wagyu burger at the Bear and Star. Afterward, make like a local with some Wranglers and a Carhartt vest at Jedlicka’s Western Wear & Saddlery, which has been rounding ’em up since 1932. Ballard (population 467, give or take) is old-fashioned enough that it still has a little red schoolhouse, in operation since 1883. The least commercial of the valley towns, it offers a glimpse of how things used to be before the arrival of the wine industry. A one-time stagecoach stop founded in 1881, it shares a name with the nearby Ballard Canyon AVA (the county’s smallest viticultural area and a haven for syrah fans). You won’t find any tasting rooms in town, but newly redone in a modern farmhouse style, the Gathering Table at the Ballard Inn ($295-$475) has an extensive list of Central Coast wines to pair with longtime valley chef and inn owner Budi Kazali’s melding of French and Asian cuisines. Windmills and thatched roofs scarcely qualify as indigenous California architecture, but like Olvera Street, Solvang has attained a kind of authentic inauthenticity. Many of the half-timber buildings, constructed in the medieval bindingsvaerk style by Danish settlers, date to the 1930s, making the townscape positively venerable by SoCal standards. Solvang is at its best early in the morning—prime time for a jam-filled aebleskiver at the Solvang Restaurant— or late afternoon, once the day-trippers have bid farvel to the Little Mermaid fountain. The hamlet has a few surprises, too, starting with that 1949 Vincent Black Lightning at the Solvang Vintage Motorcycle Museum. And if you’re looking for digs, the Nordic-chic stylings of the Landsby hotel ($149-$649) set it apart from the Danish not-so-modern inns elsewhere in town. The hay trucks and horse trailers that share the road with visiting Karma Revero drivers are reminders that the Santa Ynez Valley is still horse country. No town around here is more western than the valley’s namesake, Santa Ynez. Those horseshoes embedded in the crosswalks honor local riders and their steeds—the valley version of the Hollywood Walk of Fame. 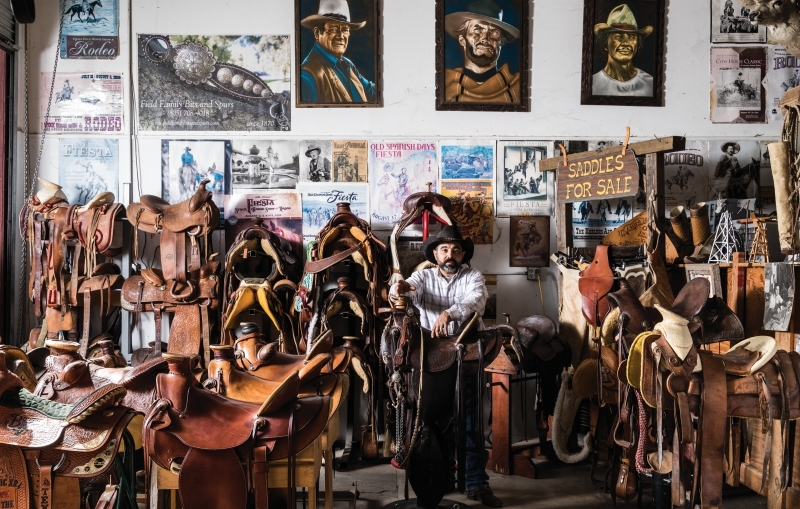 When you’re in the market for a keepsake key chain, or even chaps, look for master leatherworker Juan A. Lara, a third-generation saddlemaker who operates in an old red barn on Manzana Street. Country bands play into the night at the Maverick Saloon, a honky-tonk with brands singed into the bar. Not your thing? Half a block from the saddlery at S.Y. Kitchen, chef Luca Crestanelli brings a modern touch to light-as-air spinach-ricotta gnocchi with porcini mushrooms in a duck ragù. Next door to the Maverick, the patio at Trattoria Grappolo has been a gathering place for celebs, winery workers, and ranch hands alike for more than 20 years. The ranching town of Los Alamos is now a food destination all its own. Here are four essentials. Bell’s: Daisy and Greg Ryan have refashioned Bell Street Farm into a French-leaning all-day café. They bring serious bona fides, with stints at places like Per Se and Gramercy Tavern. And Daisy, who oversees the food, grew up nearby. Bob’s Well Bread: Bob Oswaks, a Sony marketing exec in an earlier life, renovated a 1920s gas station for his artisanal bakery. If you’re in a hurry, grab a ham-and-cheese croissant or a flaky kouigamann, though that meatloaf sandwich (above) with caramelized onions is worth the extra time. Full of Life Flatbread: Cooked in a giant hearth that commands the room, the flatbreads range from one starring a house-made pork, blue agave, and fennel sausage to a date-and-bacon variation with walnuts and blue cheese. Plenty on Bell: The beloved Cafe Quackenbush may be gone, but its chef, Jesper Johansson, continues to delight with such favorites as a plenty sloppy slow-cooked pulled pork sandwich.